The Board of the TD Baltic Group’s today announced that Rūta Dabašinskaitė-Vitkė has been appointed as the new CEO of the company and takes over the duties from Ervinas Leontjevas, who was the CEO of the company for more than 12 years. This step is a completion of the process of updating the Executives team, which has taken place over the past few years. Rūta Dabašinskaitė-Vitkė has held one of the key positions in the TD Baltic Group for 11 years. Rūta holds a master’s degree in Management and Business Administration from Vytautas Magnus University and an International Executive MBA from the Baltic Management Institute. The new CEO will assume her role as of the 3rd of September 2018. The long-term CEO of the company, Ervinas Leontjevas, will no longer be involved in everyday operational tasks. He will remain as an Advisor to the Executives and he is a Member of the Board of the TD Baltic Group. The TD Baltic Group has been operating successfully for 25 years and represents 86 vendors and has over 2’000 customers. 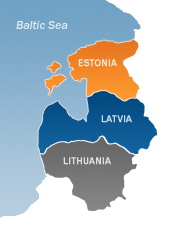 The TD Baltic Group has 65 professional employees across all three Baltic countries. The Company’s turnover for 2017 was EUR70million (+26% growth compared to 2016). The growth for 2018 H1 is +22% (compared to 2017 H1). TD Baltic is one of the biggest distributors of IT products in the Baltics with full product portfolio. TD Baltic is one the biggest distributors of IT products and Home appliance goods in the Baltic region with focused divisional setup and full product portfolio covering all IT products. Company also provides logistics management and other value added services to its clients in the Baltics. The company focuses mostly on selling to business-to-business (B2B) resellers. TD Baltic management, logistics and back-office teams are located in Lithuania, with sales teams in all three Baltic countries (Lithuania, Latvia and Estonia). Key products include notebooks, personal computers, servers, storage, networking and software. Major brands are HP, HPE, Dell EMC, Cisco and Philips. TD Baltic has 115 vendors, over 2’000 customers and 65 employees across all three Baltic countries. Year 2017 turnover – 70 million EUR.